FARR NAUTA '95 - "DHARMA"
"Dharma is the second Farr Nauta '95 boat to exit the Southern Wind Shipyards. It is not the first time that these three entities namely, Southern Wind, Farr Design and Nauta Design, decide to collaborate, the synergy between them, has contributed to strengthen the position amongst the big names in sailing boat construction, of the Cape Town based yard. "Dharma", also enjoyed this form of 'joint treatment'. 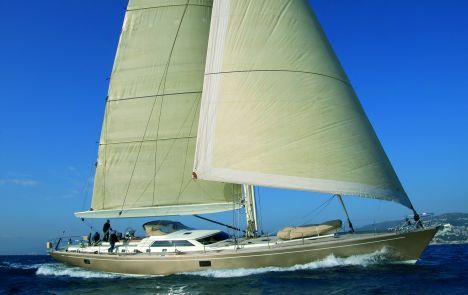 As Farr Design developed the water lines, accessories and sail plan, Nauta Design took care of the outer and interior designs. The hull was mainly designed for fast cruising and blue open water regattas and therefore had to have an imposing sail plan as well as a construction strategy aimed at containing weight in order to favour performance. This was attained by using a blend of light, as well as tough materials such as glass fibre, kevlar and carbon all duly impregnated with the correct amount of resins. Indeed the hull was built with a mould blend of carbon fibre for the internal parts and one of glass fibre and kevlar for the exterior to guarantee a better impact resistance. The essence of this sandwich is instead constituted by Corecell, a plastic foam the density of which varies from area to area, offering greater resistance in points of greater stress, and lightness to those less likely to receive impact. In respect to "Maya Ray", the first 95' to be built and whose super-structure is in fibreglass "Dharma's " deck is built in carbon fibre which augments its overall structural rigidity while reducing its weight. In order to facilitate manoeuvres even in reduced crew conditions, Harken deck accessories and equipment have been installed which can largely be operated from the helm area which runs lengthways to occupy a central position in relationship to traditional layouts. This favours cockpit communication and frees the stern area so that it can be dedicated to sun-bathing. The cockpit area is arranged with cushions all round and with two centrally positioned tables making the area both comfortable and convivial both for open air meals and pleasurable cruising. The deckhouse hosts a "c" shaped sofa placed round a table as well as a chart table. Descending just a few steps towards the bows we access the area below deck, where we can find the main saloon with relative "c" shaped sofa and dining table to port, and a further two sofas and cocktail tables to starboard. This area a-midships, divides the guests and crew quarters. The guests' sleeping quarters include the owner cabin suite, complete with small office area and private bathroom remotely placed in the stern, a further two double cabins and one single also with private bathrooms. The crew's sleeping quarters are situated in the bow area of the deck which is made up of a large galley area, dining area, and two cabins with bathroom, of which one double and the other with bunk beds. Sail lockers of generous proportions situated at the bow's end are accessible directly from the deck. It should be pointed out that even though meticulous care was taken to limit unnecessary weight during the design phase, the interior is well finished with fine materials, it is complete with full entertainment equipment thus enhancing the yachts ability to offer a pleasurable trip. The furniture is not built in but it is positioned so as to absorb and limit vibrations. Furthermore a great part of the furniture is made of honeycombed structures lined over in wood, a sophisticated solution perhaps to allow for optimal and correct weight distribution. The result of the designers' and the yard's great efforts in the construction of this cruiser/racer, were most apparent when witnessing its performance during a crossing from the Canaries to Barbados which took only 11 days frequently reaching top speeds of 24 knots.